Viggo Mortensen's drive to express himself in a variety of media has resulted in a volume of surprisingly good work. A photographer since his teen years, he took up painting more recently. 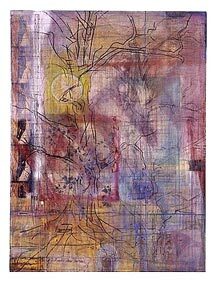 Many of his pieces are almost collages of painted canvas with fragments of photographs and poems. Often his photographs are manipulated, scratched and written on as well. I was stunned when I first listened to Viggo's poems and music. They were completely unexpected, and I've found that the more I listen to them the more they grow on me. Many of his poems are gems when read on the book page. But when Viggo reads them in his low, husky voice, often with musical background or sung to simple melodies, it generates an emotional charge that seems to drill the words directly into my soul. Is this fine art? An actor's craft? I just know that I like it. I've included some audio clips here so that you can judge for yourself. Don't miss "Angeleno." I laugh out loud whenever I listen to it. For Viggo's paintings and books I recommend going to the Perceval Press web site (see bottom of this page) and browsing their selection. I can personally recommend Coincidence of Memory and Recent Forgeries and am saving my pennies for Sign Language and Miyelo. Several of the Viggo Mortensen fan sites listed on the Viggo links page have quite a few online samples of Viggo's work. In an exclusive interview, Viggo Mortensen, who plays Aragorn in "The Lord of the Rings," talks about Miyelo and his other photography, his indie publishing house, and why Bush will go down in history as the Sauron of American presidents. The most extensive political statements we have seen from Viggo. You will need to sign up for a subscription or a free "day pass" to view the full article at Salon.com, but it is well worth it. Article on small independent presses includes a description of the output of Viggo Mortensen's Perceval Press and some speculation on its focus. Viggo is quoted as saying, "Perhaps the attention derived from the publication of Twilight of Empire: Responses to Occupation has given some people the mistaken impression that we concentrate on overtly 'political' or 'progressive' material." He goes on to state that Perceval "will remain open to publishing new and different material as well as points of view." Viggo Mortensen's art work is the subject of numerous books (available from Perceval Press, below) and has been exhibited at galleries around the world, including The Robert Mann Gallery, Track 16 Gallery, Fototeca de Cuba, Museet for Fotokunst in Denmark, The Wellington City Gallery and Massey University in Wellington, New Zealand. Element of Surprise - A reference site for Viggo's art works. At its core is an extensive Viggo Mortensen Art Glossary with definitions of terms used in the names of his art, poetry and movies, from the location of Adelaide Road to the translations of "mitakuye oyasin" (Lakota) and "whakato rakau kia puta te ora" (Maori). In addition you will find lists and dates of all the works in each of Mortensen's books and exhibits. For about 20 of his best-known photographs, the site provides details on camera and lens used, dates and locations, plus comments from reviewers. Finally, photo buffs will enjoy the section on the "special defects" Viggo sometimes employs, including blurring, flares and sprocket shadows. Making of Miyelo - In an interview with House of Telcontar, Viggo discusses some of the inspirational, social and technical aspects to the making of the photographs in the Miyelo series. Robert Mann Gallery: Viggo Mortensen - Images of works displayed at the gallery. See also this description of the work exhibited in the summer of 2002. "Mortensen works in a variety of different media - he is an accomplished photographer, painter, poet and actor. His photographs are carefully observed meditations of life - among them are portraits, landscapes, and abstractions. Finding beauty in unlikely places, Mortensen captures and preserves moments that would otherwise pass by unseen. His mixed media works are dense with paint, fragments of photographs, scraps of cloth and paper, scrawled words and various found objects. These works invite the viewer to unearth emotions and memories layered beneath the surface of the canvas." Signlanguage Exhibition Spring 2003 - Richard F. Brush Art Gallery, St. Lawrence University - Description includes three sample works, two poems, and an excerpt from Kevin Power's description of Viggo Mortensen's work, a line from which reads, "Mortensen seems to suggest that all incidents are photographable; perhaps none carry more significance than any others, or they carry the overwhelming significance he has given them through his involvement." Viggo Mortensen at Track 16 Gallery - Description of the Signlanguage show, December 2001. "Mortensen is convinced that photography, whatever else it may be, is a focusing on detail. Mortensen likes sotto voce details; he gives his attention to instants that would otherwise have passed by unobserved, or more significantly, unregistered. His work suggests a view of life where experience has value without the artist intervening to rearrange and structure it." See also this description of their Recent Forgeries exhibit. Viggo Mortensen's Miyelo at Stephen Cohen Gallery - Description and examples of the Miyelo photographs featured in this fall 2003 exhibit, along with quotes from Viggo about the meaning behind the images. Click here for eight more photos from the exhibit. Viggo Mortensen: Miyelo Portfolio - Salon.com offers a Flash-based slide show featuring Miyelo images 4 through 15. Here are some sites with examples of Viggo Mortensen's poetry. Again I will encourage you to go to Perceval Press and buy the books. Viggo Mortensen - poetry - From the "artist, poet, orc-hunter" site, a page of favorite poems. She has also posted paintings and photography. Viggo Mortensen Art, Photography, Books - Wondering in which book a particular poem, painting or photograph appeared? Here you will find a list of the contents of Viggo's books and CDs. Don't Tell Me What to Do - Complete RealAudio recordings of the out-of-print CD "Don't Tell Me What to Do." Wonderful tracks including many of my favorites: Angeleno (silly song), Kaerlighed (in Danish), El Desconocido (Spanish), many poems. No clunkers in the lot as far as I'm concerned. This site has been down for a while and only recently reappeared; don't count on it to be available forever. And don't bother to follow the link to mp3.com as Viggo's work is no longer there. TDRS: Forum Discussion - Travis Dickerson Recording Studios is the location where Viggo Mortensen has been recording his CDs the past few years. In this forum discussion from June 2004, Dickerson indicates that he is recording a new CD with Viggo, Henry and Buckethead, due for release fall, 2004. In addition they are planning to release a "Best of" from the currently out-of-print CDs. TDRS: pandemoniumfromamerica - From TDRS, where pandemoniumfromamerica was recorded, a list of the tracks and performers, plus a dozen great photos from the recording sessions. You can order from this site or from Perceval Press (see below). TDRS: Viggo Mortensen - Travis Dickerson Recording Studios, where please tomorrow, pandemoniumfromamerica, and some of Viggo's earlier works were recorded, provides information on the releases. You can order from this site or from Perceval Press (see below). Viggo Mortensen & Buckethead - Viggo talks at length about his collaborations with Buckethead: "He's very pure, as a person and as a musician, at least in my experiences with him." The article also explains the mystery of Buckethead's Japanese connection, concluding, "Let's just say that he was raised by Japanese chickens." Here are a few samples (all MP3 format) from Viggo's out of print CDs to give you a taste of the variety of styles he has worked in. If you like these, I heartily recommend purchasing the Recent Forgeries book/CD combination from Perceval Press. Then move on to Pandemonium from America -- it has a prickly exterior but gems are hidden within. Posting these is a compromise with my conscience. Viggo prefers that his recordings not be posted on the Internet. However, these are all from out of print CDs so there is no other way to hear the works. Also, all of these MP3s are widely available. Obsession has a substantial collection. Many Faces of Viggo Mortensen has a more modest collection, including some I've seen nowhere else. Angeleno - An easy favorite, this sweet humorous song-poem from Don't Tell Me What To Do CD (OP). Cursive - Story of a relationship in a few well-chosen words, in this poem from One Less Thing To Worry About CD (OP). Edit - A brief actor's lament, in this poem from One Less Thing To Worry About CD (OP). Envidia (Envy) - Sung in Spanish, with guitar accompaniment. Another song I didn't appreciate until I'd listened to it several times. From One Less Thing To Worry About CD (OP). His and Hers - A failing relationship reduced to its bones in this poem sung to a simple melody. From Don't Tell Me What To Do CD (OP). Kaerlighed - Another Danish song-poem that works its way into your psyche. I have no idea what the words mean, so I let go of meanings while listening. Viggo's voice becomes simply an instrument. Not sure where it was first published. Vista Blues - A 2-minute spoken poem with Buckethead backup that leads you down an unexpected path. Downloaded from the Net, not sure where it was first published. You can get some of Viggo's books from Amazon.com, but I recommend going directly to his press -- their prices are just as good or better, availability is better, and service is top-notch. Perceval Press - Viggo Mortensen started Perceval Press with partner Pilar Perez. They publish books and CDs containing Viggo's poems, paintings, poetry reading and music. They also publish other lesser-known authors and recently a book speaking out against the war in Iraq. I recommend buying directly from them online; their prices are reasonable and the shipping is incredibly fast. "You try to communicate to others and to yourself, whether it be through a photograph, an e-mail, or an idea. Or if I just want to show you a pond. Just making the effort. There's a yearning to connect." As quoted by Tom Roston in Premiere, "The Hero Returns"
"Sometimes I stand in front of my paintings and think: God! What's that for? And then I question everything: Am I a good actor? Am I a good father? I should stop bothering people with this crap! I can understand why people jump out of windows." As quoted by Ulrike Schroeder, "The Crowning of the Shrew"
On acting, writing, painting: "They are like branches of the same tree. They feel similar, and all have to do with being in the moment. Not just walking by and not noticing your surroundings. Once you get in the habit of, say, taking a camera with you, whether you use the camera or not, the potential that you might means you are already looking at things in a different way. It's a start, isn't it?" "People who are creators create. People say to me all the time, 'Why don't you just focus on one thing?' And I say, 'Why? Why just one thing? Why can't I do more? Who makes up these rules?'" As quoted by Alex Kuczynski in Vanity Fair, "Finding Viggo"
"It's not my place to say who is an art fan and who isn't. If someone wants to come to a gallery because they like me as an actor, I welcome them. If they end up leaving with an appreciation of art, that's great. If they leave just having a great time, that's fine with me as well. But you don't have to have studied art to know what you like and what is pleasing to you." As quoted by Jae-Ha Kim, in the Chicago Sun Times, "Viggo Mortensen rides back in 'Hidalgo'"